Artaserse was first performed at the Teatro delle Dame in Rome on February 4, 1730. (Less than four months later Leonardo Vinci was dead, possibly poisoned as the result of an injudicious love affair.) The libretto was by Metastasio: it became extremely popular, Vinci’s being the first of nearly 90 settings (including two each by Jommelli and Bertoni). A CD recording was warmly welcomed by David Vickers (Virgin, 1/12). 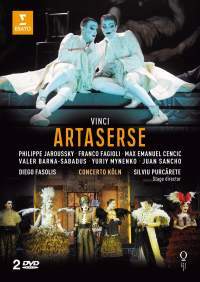 The performers on this DVD are identical, save for Juan Sancho replacing Daniel Behle as Artabano; the musical text is the same, apart from the omission of two arias in Act 3, for Semira and Mandane respectively. The first thing to say is that it is wonderful to have another example, following the recent DVD series of operas by Pergolesi, of the ‘Neapolitan’ style that proved so influential. But although I enjoyed the CDs, I am less enamoured of this staging. As with the Paris production of Massenet’s Werther (2/11) – is this becoming a French trademark? – we see entrances and exits from the wings; stagehands provide umbrellas or help the cast to dress. The décor is simple, with a platform that rotates from time to time. The costumes, on the other hand, are extremely elaborate. There are fullbottomed wigs, enormous plumes, and inverted horns that make the villainous Artabano look like a disgruntled bull. As David Vickers reported in his review (to which I would refer you for a summary of the plot), women were not allowed to appear on stage in Rome, and there are no female singers in the cast here. We have long since become accustomed to mezzosopranos singing castrato parts: casting men in women’s roles is for me – visually, at any rate – a step too far. Fans, pearls, false bosoms: Mandane and Semira together are inescapably reminiscent of Hinge & Bracket. The artifice extends to the male characters, too, with their rouge and lipstick. All have whited faces, like Pierrots. Having sopranos – and they really are sopranos, not countertenors – in the male roles certainly gives one an inkling of what it was like in 1730. The singing is terrific, though some of the cadenzas range so high that you might get a sore throat. See for yourself; but I shall return to the CDs, where, as they say with radio, the pictures are better.